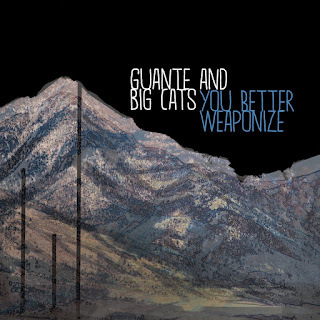 Guante & Big Cats' YOU BETTER WEAPONIZE Available Now! 1. You can stream/purchase our new album NOW. You can listen to the whole thing at this link, and please buy it if you like it. It’s also on Itunes, Amazon, the Strange Famous store and elsewhere (and you can still get physical copies at shows), but Bandcamp is the best; it has the most artist-friendly profit split. I’ve poured all of my mental, spiritual and artistic energy into this album; I really hope you like it; every purchase means a lot to me personally. Friday, November 9 at Hell’s Kitchen in MPLS, 10pm. Facebook link. If you’re in town, it’s going to be a one-of-a-kind show and we’d love to see you there. It’s 18+, and only $5 if you’re 21+ ($7 if you’re 18-20). Mankwe, Chantz + Julian + 80H20 of Audio Perm and the New Heist b-boy crew will also be performing. If you only come to ONE of my shows this year or any year, this should be this one. Write a review! If you buy the album through Itunes or Amazon, please take a second to leave a review. If you buy it through Bandcamp or in-person, please throw up a Facebook post with why you liked it and link to the album itself. Spread the word! Post our music video or the Bandcamp link on your Tumblr, Facebook wall, personal blog or Twitter. Post/upvote us on Reddit. Play it for your friends in the car. Say something nice; let people know why this stuff is worth checking for. It seems like a little thing, but it makes a huge difference. Book us. If you’re in college, get in touch with me at elguante@gmail.com and we can work through how to bring us there. I have a ton of experience booking shows at colleges and universities and even if you don’t know where to start, I can help. We hope you like the album. Thanks so much.